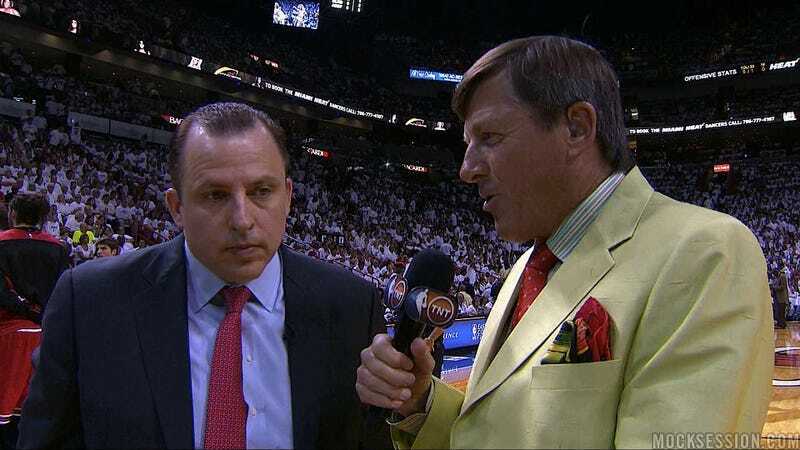 Tom Thibodeau is coaching about as well in this series as Craig Sager is dressing. So much Bogans. So much Korver. So little stopping of LeBron, Wade, and even Bosh. Accordingly, the Bulls lost two consecutive games for the first time since February. Miami's up 2-1 and at home tonight, which probably makes this a pivotal game, or some such thing. The Bulls have a couple injuries, too—Omer Asik being the biggest one. However, Asik did show up for the Bulls' shootaround. So, then, will Bosh be the turkey? Or will Turkey beat the Bosh? Stay tuned. Also, Rick Reilly likes the Heat. I want to hate the Heat, want it like my next breath, but Wade is nice, James is fun, Bosh is sincere, Spoelstra is cool, Riley is brilliant, and the way they all play is so damn selfless, I can't. I'm pissed that I can't be pissed. These are life-or-death stakes, folks. Game's on TNT, right about now.